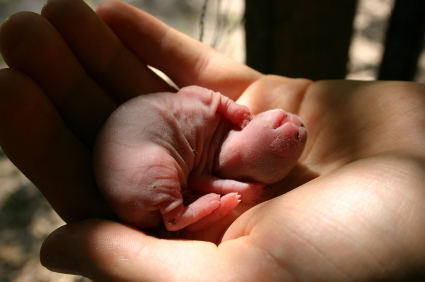 Newborn Baby Rabbits – Boy they’re ugly! When you get your first litter of baby rabbits (also called “kits” in the rabbit world) you’ll be excited to pull back the fur over the nest and check them out. Baby rabbits are born with almost no fur and with their eyes closed (not very cute) but give them a few weeks and they will transform into the most adorable creatures on the planet! Here is a quick guide to checking over your newborn baby rabbits to make sure they grow up happy and healthy. 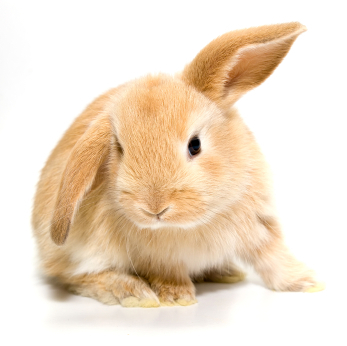 - Part the fur and hay in the nest to get down to baby rabbit kits. You may have to pull the nest box out of the mom’s cage if she’s cranky and doesn’t want to let you inspect her babies. - Take out each kit and make sure they are healthy and alive (and hold onto them, those little guys can squirm out of your hand in an instant!). Remove any babies that didn’t make it. - Make sure that they have full little bellies (it means they are being well fed). - Place them back in the nest box and put the nest box back in the cage in the same place it was before you removed it. Continuing to check on your baby rabbits every day. This is a great way to check on your bunny’s health and to get the babies accustomed to being handled by people. If you make a habit of handling your baby rabbits then they will grow up being comfortable with people and will make excellent pet or show rabbits. 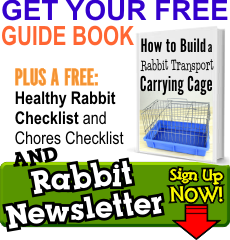 And check out our book for an in-depth look at raising and breeding rabbits.